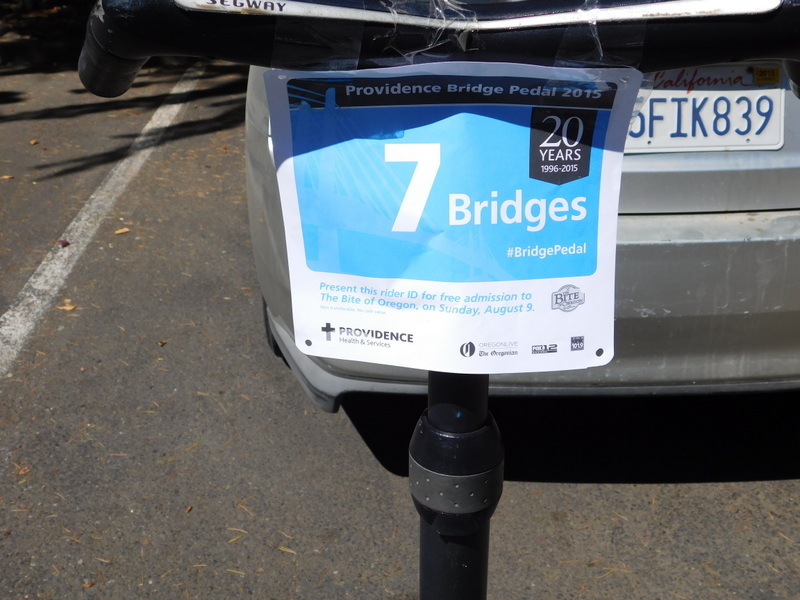 To start, i did the Seven Bridge ride. Across the Hawthorne Bridge, south to the Tilikum Crossing, over and back on that, then further south to the Ross Island Bridge and across that and north to the Marquam Bridge, across that and north to the Burnside Bridge, across that and north to the Broadway Bridge, across that and north to the Fremont Bridge, and across that. At which point i somehow missed the fork in the trail that directed the Seven Bridgers back to the waterfront (step 53 “veer left onto NW 15th”) and then realized that i was heading in the wrong direction, toward the St. Johns Bridge five miles to the north. Acute range anxiety set in as i realized that while i could make it to the St Johns Bridge, it was somewhere between doubtful and highly unlikely whether i could get all the way back to the hotel before i ran out of juice. So i stopped and queried one of the ride monitors. She was very nice, like everyone i’ve encountered in Portland, but her ignorance of the routes was profound. Worse yet, since i’d just been going with the flow of the riders since the beginning, i had no idea exactly where i was. Break time to study a map, which revealed that all i needed to do was just head east toward the river. 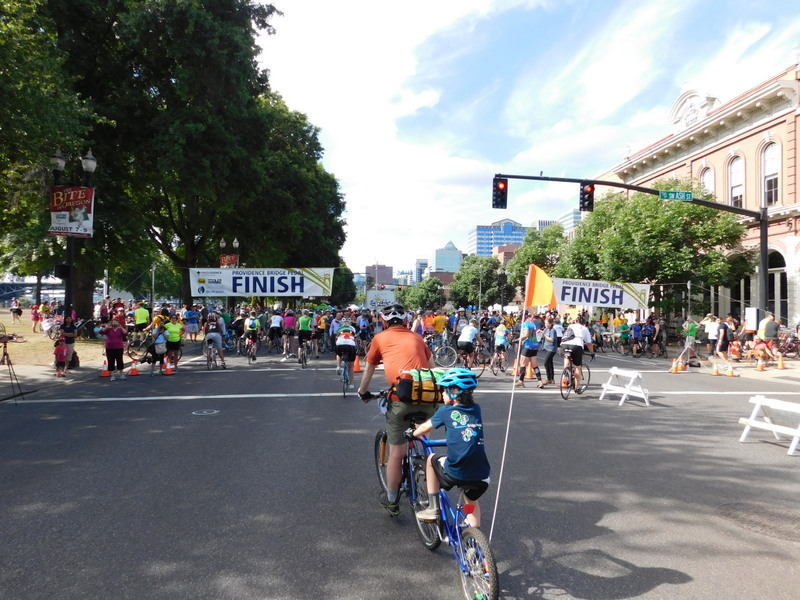 And sure enough, after only a mile or so i came across the pack of riders headed toward the finish line. Conveniently at the Finish point was the Portland Saturday Market which, despite the name, is open both Saturday and Sunday. It describes itself as “the largest continually operating handcrafted arts and crafts market in the nation” with “exotic foods” from “over twenty international food booths”. So it’s really just a flea market and a bunch of fast food stalls but no fresh produce. But next to that was the Bite of Oregon, an assembly of gourmet food stalls where i went ahead and had an order of fairly good barbecued pork ribs and a superb scoop of chocolate ice cream from a local ice cream company. If i come back to Portland, i’ll hunt down the kind of market i really enjoy…a farmers’ market. And then back home for a two hour nap during which i recharged both my batteries and the Segway’s. Once across the Tilikum Crossing, i headed south along the east shore bicycle path under the Ross Island Bridge and four miles down to the Sellwood Bridge. Went on along the bike path a bit farther and managed to find a vantage from which i could finally get a good pic of this bridge. ta da. Then back west across the Sellwood Bridge’s unnervingly narrow bike lane and then north along the bike paths, where i found a food opportunity. 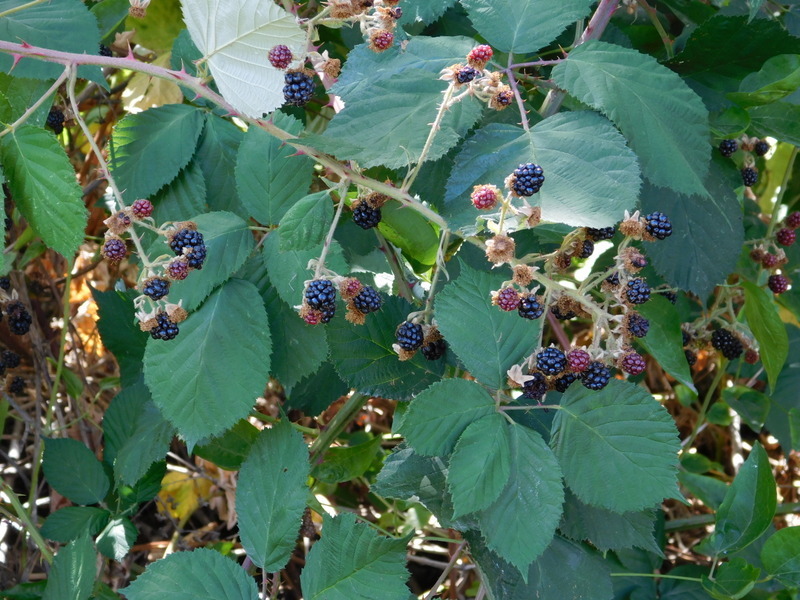 I didn’t have Sacagawea with me, but even i am capable of spotting a blackberry patch along the trail, so i skidded to a halt and got all stained and scratched foraging for my fill. In town, i stopped at the foot of the aerial tram and got good pics and had a series of splendid conversations with locals. At the recommendation of my favorite waiter at Baan Thai, i went to the Rogue Brewery pub with the idea of eating supper, but they didn’t seem to be serving food, so i just had one of the excellent local beers and then stopped at a gyros stand, where i ate about a third of the worst gyros i’ve ever had before returning home to write this. Oh, and thank goodness i bought those new batteries for the Segway, as i calculate i’ve ridden over thirty miles today with a two hour recharge in the middle. A gloriously successful day during which i got lots of pics that i’ll be able to use in the photo essay and had several excellent encounters with natives. We agreed that, like San Francisco, folks here just love tourists even though we treat locals with far less kindness. I’ve had too many delightful encounters to detail, but perhaps the finest was with a couple of young mothers and their little girls who were out to enjoy the park near the west foot of the Tilikum crossing. All of ’em tried the Segway, but the champ was the smallest girl, who i’d feared would not weigh enough to ride the Segway. Silly me. The little thing was utterly fearless and by throwing her full weight into it, intuitively rode the Segway with frightening (to me and her mother) aggression, maxing out the speed and cranking the turns to the fullest. Thank goodness i had her on the beginner key. 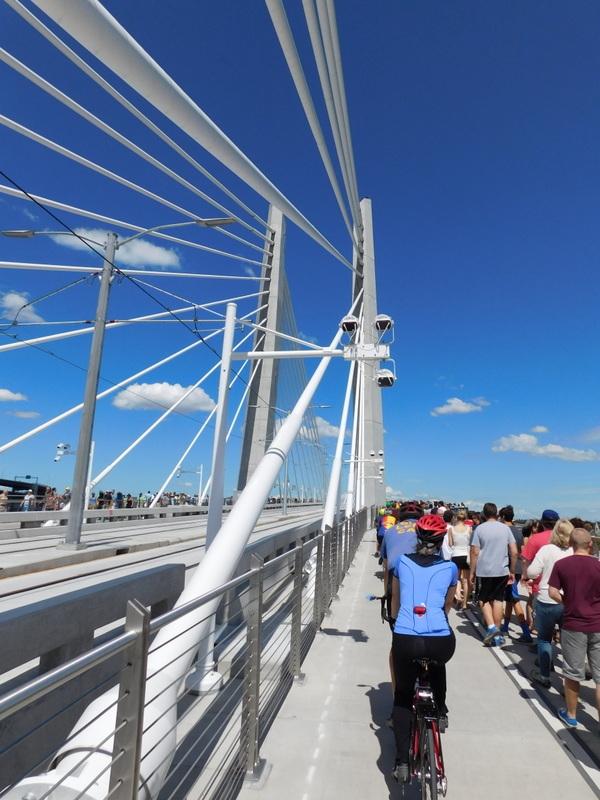 The most entertaining yesterday was a man who was a volunteer ride monitor and turned out to be very knowledgeable about the bridges. I’m such a bridge enthusiast that by now i actually know more about the local bridges than some of the locals, and this guy and i got a good laugh out of my enthusiasm for drawbridges and my being crushed that the river is now so low owing to the drought that the drawbridges need to be opened only for the largest boats. He observed that the locals view this as the only plus about the drought, as they complain bitterly about being delayed for ten minutes when a bridge has to open when they want to cross it. Oh, and i’ve confirmed last year’s hypothesis that trash cans cause trash. We have trash cans at virtually every corner in San Francisco and yet we are awash in litter. In Portland, on the other hand, you have to hunt hard for a trash can, and yet the streets are pristine. Go figure. That’s sad about the river level. It’s always fun to see who takes to the Seg and who fears it. People like me who are usually out of balance anyway, have some difficulty. Cooper lets anyone who want to use his Seg (formerly Matte Gray’s) give it a go, and you see immediately who gets it and who doesn’t. Glad your odyssey has been so successful. Look forward to more photos. Anticipating popular demand, i’ve added more photos to the previous posts for this trip. And yes, it’s fascinating who immediately takes to the Segway and who doesn’t. I just love giving folks trial rides and routinely offer.